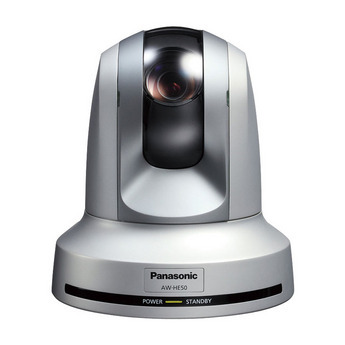 Panasonic's AW-HE50S HD Integrated PTZ Camera (SDI Model) is an all-in-one unit that forms the key component in a complete IP and Serial-control capable system. The integrated pan-tilt-zoom mechanism can be operated remotely by Panasonic AW series controllers, computers, or control systems from third-party manufacturers, all via RS-422 serial control. A full 1920 x 1080 MOS sensor and 18x optical zoom lens deliver HD or SD imagery in a variety of resolutions, achieving exceptionally natural results due to Dynamic Range Stretch (DRS), Hybrid Noise Reduction, and a new Flesh Tone function. The video can be output over professional HD/SD-SDI or, using an optional breakout cable, composite or component connections.